Later in the Asian market, Japan will release some economic reports such as Retail Sales YoY and the US will publish Core Durable Goods Orders which is expected to come low. The support rests at 109.600 with resistance at 110.290 which the weekly pivot point at 110.100 is located in between the lines. 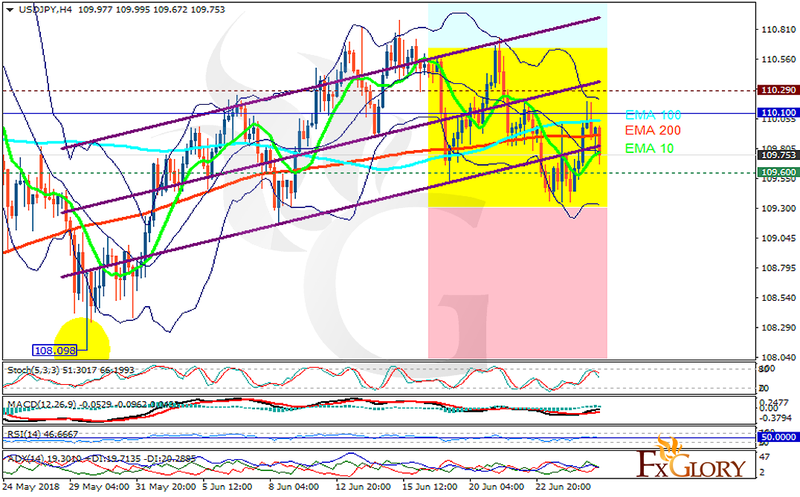 The EMA of 10 is moving with bullish bias in the ascendant channel and it is below the EMA of 200 and the EMA of 100. The RSI is moving on the 50 level, the Stochastic is showing downward momentum and the MACD line is above the signal line in the positive territory. The ADX is not showing any clear signals. While the lower Bollinger band remains the floor, USDJPY may be fluctuating within the upper and lower Bollinger bands.